Whether she realizes it or not, interior designer Beth Kooby of Beth Kooby Design can’t help but create spaces that have a cozy, feel-good vibe. Before she took the leap to start her own interior design business in Atlanta, Beth was a busy oncology nurse and then a nurse practitioner for 20 years, so her instincts are to listen to clients — and then create a happy environment for them. Interior designer Beth Kooby used color and brass in small but important ways in the kitchen. Portuguese backsplash tiles from Everett and Blue provide a picturesque backdrop for food prep. A brass-lined hood from François & Co has all the right curves. Pendant lights are an ideal size, a classic design from Kelly Wearstler through Circa Lighting. Open shelves in the living room continue the arched motif seen elsewhere in the house. A custom sectional sofa in a Chesterfield style from Bjork Studio is covered in a sumptuous green velvet with bonus points: the material is a durable performance grade. Ceiling beams, armchairs and a round coffee table bring in the warmth of wood in the living room. The colorful rug is by Delinah Simmons. A whimsical light fixture in the breakfast room is from Dear Keaton, the table by Crate & Barrel. Vivid abstract art by Ginger Oglesby thru dk Gallery further livens up the room. Not surprisingly, Beth believes our surroundings are essential to our overall well-being, and this project illustrates how she executes that notion. For this custom Marietta, GA, house, the designer made sure to include plenty of natural materials such as wood and stone. “Anything that puts you in touch with nature is healing,” she explains. “Also, even sheets are important … I love linen and jersey sheets.” Plenty of pillows and candles up that comfort level, as well, and you’ll always see plants in a Beth Kooby-designed room; plants add life to a room and are also healthy, she points out. A covered porch continues wood accents, while the stone flooring adds to the natural elements used throughout this space. Worth noting, this table can be extended for larger parties. Ceiling wallpaper and matching custom shade fabric by Lindsay Cowles from Bradley add a festive pattern to the laundry room. As an earthy contrast to all the cool colors, floor tiles from Renaissance Tile & Bath continue Beth’s love of Mediterranean patterns. 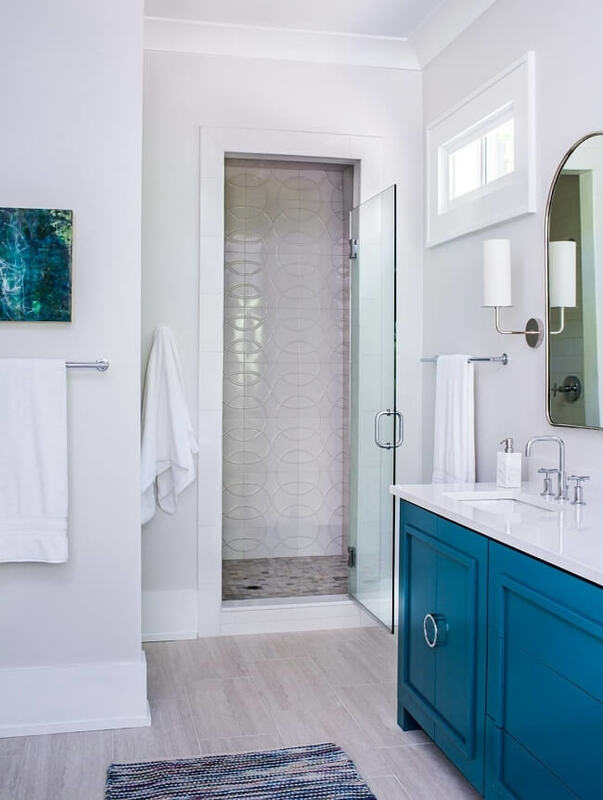 Circular shower tile relates to the rounded cabinet pulls on the bathroom vanity. A Dash and Albert rug in the bathroom adds more pattern and is easily washable. Art from dk Gallery is reflected in the mirror. Beth designed a teal vanity as a way to liven up the mostly white master bath. She found the metal piece and had it wired as a chandelier to give the bathroom an exotic accent. “This bed from Anthropologie was the jumping off point for the bedroom,” says Beth. “The wife was gaga for it, and to me, if someone loves something so much, you make it work! I went with mostly black and white with everything else to let the bed be the star.” A teal rug from Moattar, Ltd. holds its own in the room. Durable Adirondack-style chairs from Crate & Barrel circle the fireplace area. This house was for a physician — a kindred spirit — and her husband and three children. They were going for a Mediterranean feeling, with a lot of white walls but colorful accents. Most furnishings were new, but Beth and the family made sure everything had a patina and was kid-friendly. “Our goal was that anything had to still look fine if it gets beat up some,” says the designer, confirming that with both design and health, you always have to think about the future. Beth Kooby started out in architecture school but switched to nursing, all the while honing her love for houses on the side. After 20 years in healthcare, she made the leap to interior design. Since then, her work has been published in Better Homes & Gardens, Traditional Home, Atlanta Magazine’s HOME, and Atlanta Homes & Lifestyles. To see more of Beth Kooby’s design work, visit bethkoobydesign.com. Thanks to Jeff Herr Photography for the fabulous images. See more amazing Southern homes in our archives. Click HERE and start gathering ideas for your next big home project!